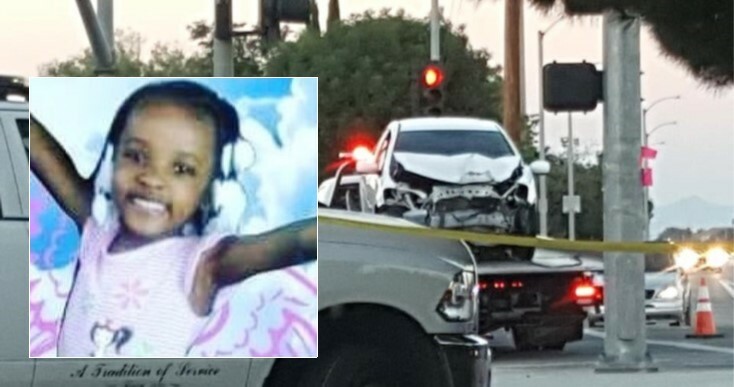 LANCASTER – A Lancaster father has been charged with killing his 4-year-old daughter and injuring his two other children in a July 3 drunken driving crash, authorities announced. Kendrick Trevon Harris, 28, faces one count of murder, two counts each of driving under the influence of an alcoholic beverage causing injury and driving with a .08 percent blood alcohol content causing injury, and three counts of child abuse, according to a news release by the Los Angeles County District Attorney’s Office. The criminal complaint includes sentence-enhancing allegations that Harris caused great bodily injury to one of the children and willfully caused and permitted another child to suffer great bodily harm and death. The charges stem from a single-vehicle crash that occurred around 4:50 p.m. Tuesday, July 3, at the intersection of Avenue K and 20th Street East in Lancaster. Harris’ children, ages 4, 5 and 9, were in the back seat of his vehicle when it crashed into a pole at the intersection, officials said. Four-year-old Kilee was critically injured in the crash and transported to a local hospital where she died of her injuries. The two other children were injured but survived. Charges were filed against Harris on July 10. He was scheduled to be arraigned Monday, Aug. 27, but the arraignment was postponed to Sept. 25, according to the District Attorney’s Office. Bail is set at $2.25 million. Harris faces a possible maximum sentence of 15 years to life in state prison if convicted as charged. The case remains under investigation by the Los Angeles County Sheriff’s Department, Lancaster Station. 16 comments for "Father charged with murder for Lancaster crash that killed young daughter"
That’s a whole lot more cops than we have. Just a few beers and you can be completely screwed for the rest of you’re life. That’s why we need checkpoints. drunk driving has severe consequences.. why do WE as humans don’t understand this!!! WE see it, WE hear it, and WE keep making this mistake…. LET’S ALL MAKE A CONCIOUS DECISION, WHEN WE GET BEHIND THE WHEEL!!!…. Drunken driving which causes a death should require mandatory prison sentence, too many bleeding hearts in California these days. Nothing anyone says or does will bring that little girl back. @Shay Williams…I care, and you are right, God have the last say. It makes since for the family to rationalize what you are calling a mistake. If you look at what it really is… He made a Conscious DECISION to drive… That’s the whole story. It is a separate Conscious DECISION if he didn’t have the proper booster or car seats. These aren’t mistakes. A mistake is something you can correct. A decision is can’t be corrected… it’s a consequence. Prayers for the family as they come to grips with this but saying it’s a mistake you will never get over it. (California Vehicle Code Section 27360.) ​Children under the age of 8 must be secured in a car seat or booster seat in the back seat.. I am betting they were not. :( sad case. Hard to say what I would do if I were a judge in this situation, would depend on remorse, the input of the mother and relatives, and how his imprisonment would effect the family if he is the breadwinner. How horrible. there is no excuse for this [removed]. Poor babies losing their sister and a father. He deserves life in prison.